Explore the Enchanted Garden to uncover hidden fireflies, unicorns, a Fairy Princess, and lots of other cute little creatures waiting to bless you with good fortune. If an enchanted garden lands on Reel 1 and a Fairy princess lands on Reel 5 at the same time - you will receive 7 Free Spins. During the Free Spins - Fireflies flutter into the background of some of the symbols and if you capture 3 or more of these fireflies , you can win up to another 3 Free Spins! All prizes are tripled during the Free Spin Feature and the Fairy Princess substitutes for all symbols, except the Enchanted Garden. She also doubles your prize. 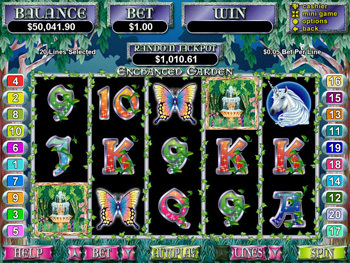 RTG has also recently released a 2nd version of Enchanted Garden Slot which has even more features than the 1st version. You can play both versions at the casinos above.